The long and chilly winter in north India this year could be linked to cold blasts from the Arctic region that have been spilling southwards since late December due to the breakdown of a wind circulation called the polar vortex, Indian Met officials said. 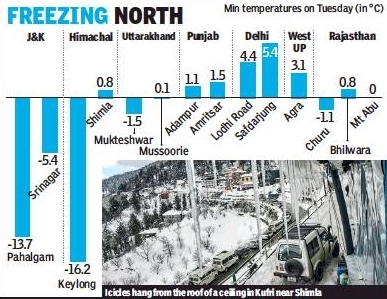 As north India continues to reel under severe cold, with the temperature dropping to -1.1 degrees Celsius in Churu, Rajasthan, an IMD official said the sustained chill over the region appears to be linked to the polar vortex breaking up — an event that has brought freezing spells in Europe and is unleashing severe snowstorms in the US. Western disturbances are pulses of low pressure winds that travel westwards from in and around Mediterranean region, bringing cold, moist winds that either hit the Himalayas — impacting northern India — or blow over to the north. This January, seven WDs have hit north India as opposed to the normal four to six. “These WDs have been impacting the region,” said B P Yadav, head of IMD’s Regional Meteorological Centre here. Ironically, the disruption in the polar vortex was caused by warm winds entering the upper atmosphere over the Arctic causing “sudden stratospheric warming” that sent temperatures up by tens of degrees. This sent the cold normally trapped in Arctic spilling out. “Snowfall is expected across the western Himalayan region — J&K, Himachal Pradesh and Uttarakhand — and the northern plains are likely to get rain with hail in some areas,” said Yadav.